You will recall from Chapter 30 that flowering plants (an-giosperms) are tracheophytes that are characterized by double fertilization, a triploid endosperm, and seeds enclosed in modified leaves called carpels. 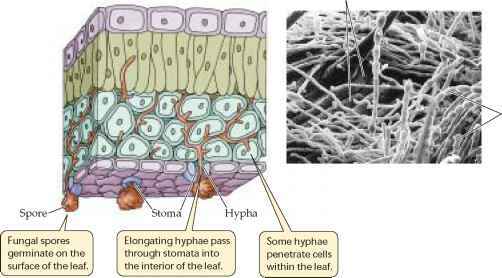 Their xylem contains cells called vessel elements and fibers, and their phloem contains sieve tube elements and companion cells. Flowering plants possess three kinds of vegetative (nonre-productive) organs: roots, stems, and leaves. Flowers, which are the plant's devices for sexual reproduction, consist of modified leaves and stems; flowers will be considered in detail in a later chapter. The basic body plans of a generalized monocot and a generalized eudicot are shown in Figure 35.2. In both lineages, the vegetative plant body consists of two systems: the shoot system and the root system. The shoot system of a plant consists of the stems, leaves, and flowers. Broadly speaking, the leaves are the chief organs of photosynthesis. The stems hold and display the leaves to the sun and provide connections for the transport of materials between roots and leaves. The locations where leaves attach to a stem are called nodes, and the stem regions between successive nodes are internodes. The root system anchors the plant in place and provides nutrition. The extreme branching of plant roots and their high surface area-to-volume ratio allow them to absorb water and mineral nutrients from the soil. Each of the vegetative organs can be understood in terms of its structure. By structure we mean both its overall form, called its morphology, and its component cells and tissues and their arrangement, called its anatomy. Let's first consider the overall forms of roots, stems, and leaves. What are the vegetative organs of a flowering plant?